As one of the nation's largest environmental, food, and consumer products testing companies, EMSL's network of laboratories has been providing quality analytical services to clients since 1981. EMSL offers analytical testing services to support investigations focused on laboratory testing of Food, Cosmetic, Pharmaceutical, Nutraceutical and Consumer Products. Laboratory capabilities include the analysis of microbes, fungi, bacteria, contaminants, environmental pollutants, asbestos, lead paint, metals, and chemicals. Additionally, EMSL provides laboratory services related to microbiology, indoor air quality, industrial hygiene, materials testing and characterization, forensic analysis, mechanical testing and environmental chamber studies for a wide range of commercial, industrial, regulatory, and governmental clients. Click here to visit our food testing website. 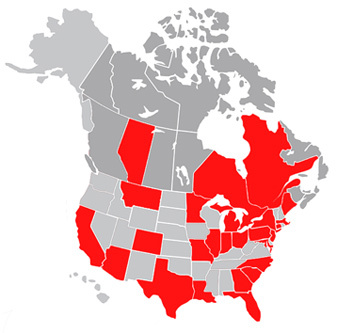 EMSL’s food, nutraceutical, personal and consumer products laboratories are currently located in St. Louis, MO, Chicago, IL, Pasadena, CA and Cinnaminson, NJ facilities. Why conduct a Shelf Life Study? Shelf Life Studies are used by the Food & Consumer Products industry to determine and validate the length of time a product will retain its quality under a certain set of storage conditions. When should you do a Shelf Life Study? A Shelf Life Study should be conducted on all new products. Additionally shelf life studies should be done when there are any changes to a product formulation, processing operation, packaging or storage conditions. Get a free poster from EMSL Analytical!